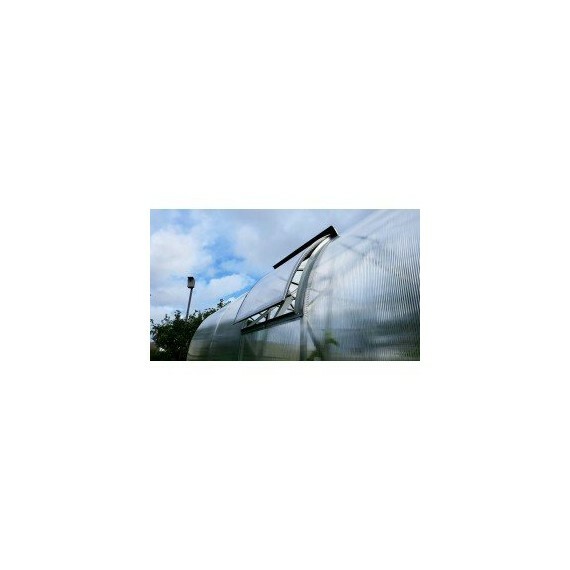 This type of vent is a window, installed into the roof of a greenhouse and designed to ventilate arch shaped EcoSlider ES greenhouses.The window leaf consists of galvanized steel frames with increased amounts of zinc and Europe produced polycarbonate cover with UV coating (secured with AntiDust ribbons on both sides), including rubber sections for extra impermeability. The window leaf is factory assembled and undergoes quality control testing. It is delivered in a cardboard box, fully assembled, and may be additionally equipped with a manual or automatic ventilation mechanism adapted for quick and easy installation. This type of vent is able to withstand extremely high wind and snow loads.